Our Embryonic or early stages of development began in the minds of Henry B. Fiske, Fred J. Karrer, Nathaniel T. Freeman, Charles E. Clarke, Eli Moore, Augustus E. Wyman, Gilbert W. Rich, William A. Clisby, Leonard T. Farris, Charles S. Winne, Hugh J. Shaw and others. Like all good ships, plan had to be made. The entire crew met in the quarters of the Henry B. Fiske at the corner of Main and Pleasant Street in Winthrop, Massachusetts on August 12, 1910. The results? Mr. Fiske was elected Chairman and Mr. Freeman Permanent Clerk. Less than five weeks later (September 18, 1910) the ambitious group met in the home of Commodore Fiske and decided to purchase land fronting Pleasant Street and belonging to Mr. Jeremiah Green. With a good keel under her, our good ship shaped up fast! 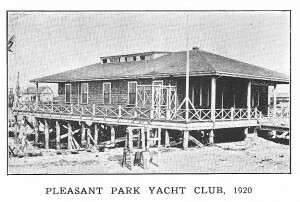 On September 27, 1910, her mainmast was stepped on the club pier at the northwest corner of Pleasant Street. An appropriate Flag Raising ceremony marked the beginning of a daily custom which continues to this day. On September 29, 1910, the members voted to draw up a set of By-laws to be presented to the then Secretary of the Commonwealth of Massachusetts, William M. Olin. Purpose? A charter of course! In quick succession an Application for Charter was made on October 12, 1910, and was granted on November 1, 1910. 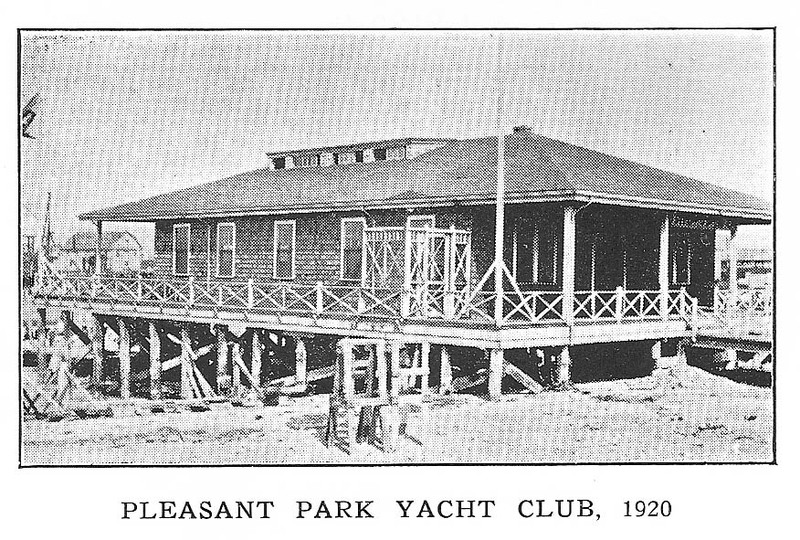 On that day The Pleasant Park Yacht Club, consisting of a pier and a float in the northwest corner of Main and Pleasant Streets became a reality. A one-story club house was started in the early part of June and completed on August 2, 1911. Dedication date – September 2, 1911! Who said things moved slowly in the old days? A little over a year had elapsed from the first organized thought to the first structure housing the Pleasant Park Yacht Club. September 23, 1911 the membership of 125 held their first meeting in the club house. The cost of construction was partly raised by dues and the sale of bonds. Alas! On December 13, 1911, Mr. Jeremiah Green granted a $3000 mortgage to run ten years. A lot of “Dredging talk went on and on with little results until the earnest of State Senator Edward Bagley resulted in the 1915 dredging of the Basin. The added depth proved a boon to sailors and power boats alike. It is said the World War I had marked the effort on our club and yachting interests in general. Whatever the cause, there was little activity during 1918 – 1924. In 1924 the membership elected Louis DeGraves as Commodore. His leadership was instrumental in reviving club activities and from then on progress became a reality. In 1926, a second story consisting of a beautiful main hall, (complete with pool tables), a reading room, a directors’ room, and a large locker room was added to the club house. The first meeting in the new hall was held on the first Tuesday in January, 1927. A second and larger dredging project took place in 1928 resulting in a large mooring basin. In turn this mooring area directly increased the number of motor boats using the club and its facilities. August 2, 1930, marked the Tercentenary of the Town of Winthrop. Pleasant Park members participated in the celebration by building and parading a large float with a replica of the Schooner Franklin on it. History says the Captain Mungford with the Schooner Franklin engaged in the Battle of Shirley Gut. Pleasant Park Yacht Club’s depiction of this event we were awarded third prize (cash) which we in turn donated to the Winthrop Community Hospital. In Spite of the “Big Depression” the club continued to prosper and period of 1932-1935 saw a new addition to the south side of the building. We then boasted of additional lockers and a tile shower bath! The period saw the beginning of the longest term of service of any of our Commodores in George Hamilton who served for 12 years from 1932 – 1944. 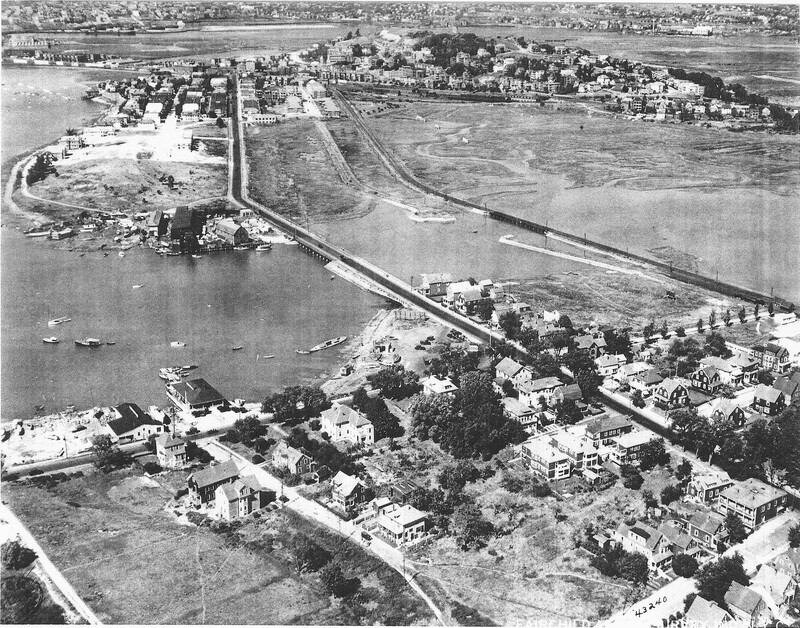 In 1934 – 1935 because of the Department of Public Works, the Massachusetts Bay Yacht Clubs Association and club interest, the Belle Isle Channel from Nunn Buoy 6 to the mouth of Pleasant Park Yacht Club Basin (4000 feet) was dredged to the depth of six feet at mean low and to a width of fifty feet thus providing easy access to the deeper water. The club membership in 1935 had increased from one hundred ninety and the number of boats to forty-four. Between 1940 – 1945 the club ran the gamut of the war years, loss of members and somewhat general post-war apathy. In spite of the aforementioned, a Commodore’s Locker and Ladies Lounge were installed on the lower deck and a fine enclosed sun room was added to the upper deck. The Regatta Committee enjoyed this room because of its high vantage point in observing the club races. Members and guests enjoyed the comparative privacy and the fine view of Boston Harbor, the Basin, and Logan Airport. With the advent of television this same room doubled as our TV room. Sometimes a “double feature” program (watching TV with one eye and the Basin with the other eye) proved a mite troublesome. 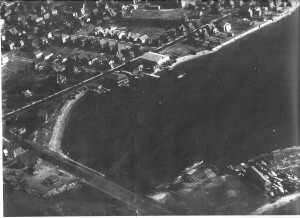 During 1950-1951 and Commodore James Doherty’s regime, additional adjacent land was purchased and the Marine Railway and parking lot was installed. Thus another milestone was reached and we literally became a yacht club able to boast of real yachtsmen facilities! 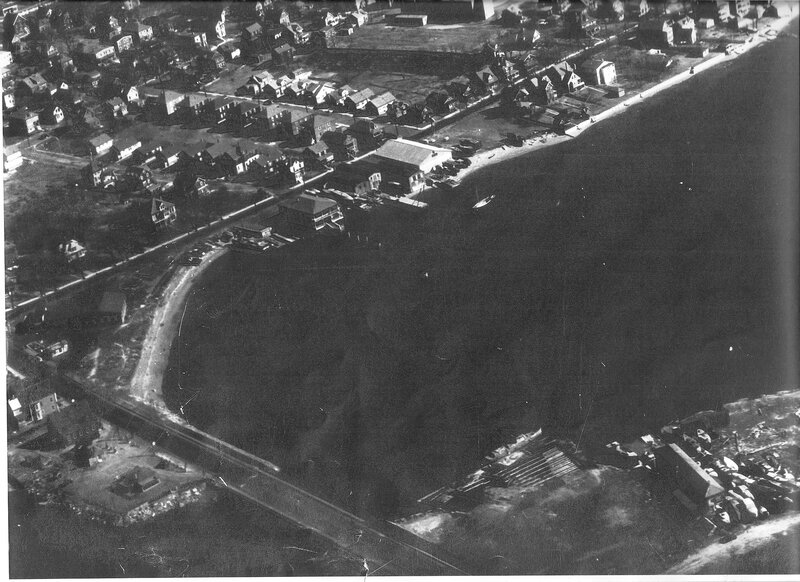 During the years 1952-1957 new pilings, Tender floats and extensive renovations were accomplished under the guidance of Commodore Lund Larsen, Henry Riley, Allan Soper, and Walter Baker. An old scow was acquired and permanently grounded to serve (with the aid of a boom) the launching and hauling of a small craft. Solid fill was obtained through the efforts of Commodore Baker and placed on three sides of the scow. Our “solid ground” area was literally doubled by this process. And then! On June 27, 1958, flames swept by a brisk on-shore wind completely devastated the club house. Fortunately, of the twenty or so members in the building at the time, only 4-5 received minor injuries. Although the members were depressed, tired and dirty that night, the prevailing talk was “a new club house – when can we start – how much will it cost…..” So many members worked, some all through the night, at salvaging the few remains of the club. Under the guidance of Commodore Augustine J. Nelson, Fund raising committees, Building committees, architects, contractors, the determination of 300 members resulted in the Commodore Lund Larsen holding our first meeting in the beautiful 90’ x 78’ 6” brick and metal building on August 4, 1959. The new building has an office, a TV and reading room, card room, check room, modern galley, ladies and men lounges, a main hall 63’ x 50’ 8” capable of seating 350 persons for dinner, a 27’ x 27’ inlaid wooden dance floor, a band stand and a beautiful main locker with a storage room adjacent to it. Our upper deck is was completed with a Commodore’s Locker, and lounge, a sun deck, fresh air and sun second to none. In 1960 James Reid, son of the builder of our Radio Class sail boats, undertook the project of reviving the class under the new name Radar Class. Bill Jenkins, Jim Doherty and Bill Crotty purchased boats and sailed them. 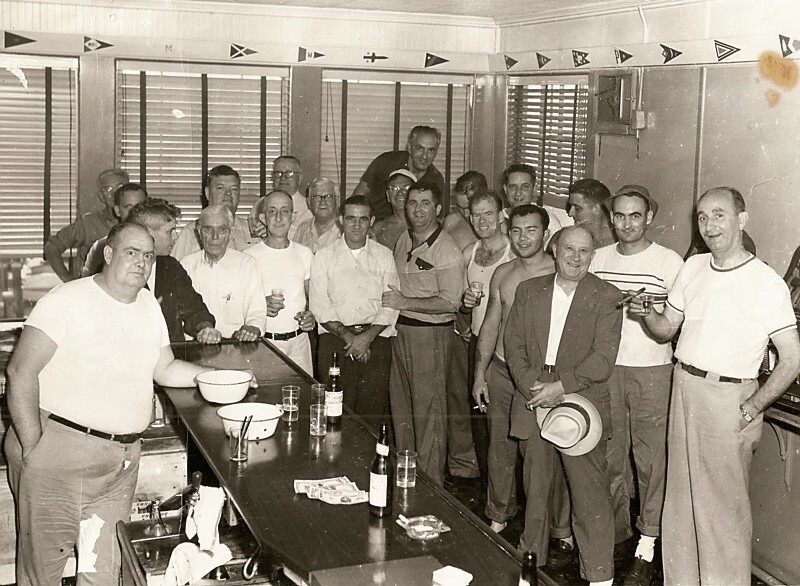 On closing night, October 1, 1960, the Pleasant Park Yacht Club recognized their efforts to revive sailing by presenting each with a suitable inscribed trophy. Other clubs in the area have purchased Radar Class boats and an old rivalry is sure to be renewed. In1963, the membership decided that it would like to complete the room on the second level. So, they all got to work and insulated and paneled the room, installed heat and built a complete bar and back bar, installed men’s room, plus a game room, laid a floor and made a sun deck that was well patronized on the hot summer nights. When the room was finished, the member’s bar was moved upstairs and renamed the “Crew’s Quarter’s.” Functions were run monthly for the members and Ruth Olsson ran a Fashion Show. The proceeds went to purchase the maple furniture for the room. In 1967, Commodore Al Marley Jr. plus the officers and Board of Directors decided that it was time to start planning for a marina. Fred Silck, Jr. drew up various plans for the said marina. The marina actually went into operation in 1968 with only a few members taking advantage of it. In 1969 thru 1971, under the guidance of Pat Marino, piles were added, new floats built and laid out to pretty near the size that it is now. 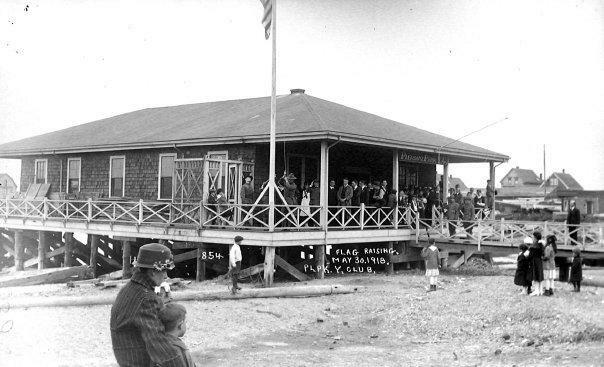 In 1968, the membership changed the By-Laws to hold the officers of Rear Commodore; Michael Massa has the distinction of being the first Rear Commodore of Pleasant Park Yacht Club. In 1970, Commodore Pat Marino decided to make a Lounge on the first floor by eliminating the game room and the reading and TV rooms. They also had a function committee, chaired by Michael Massa, Horatio Nelson and Walter Dalton, in succession. In 1977, Commodore Michael Massa convinced the Board of Directors that we should have a Piano Bar in the Lounge. Thus this was done, but it was a hard row to hoe, as members were hiring the Lounge for private affairs, so we had to shut down the lounge operations. In 1979, under the guidance of Commodore James McCaffrey, a committee was formed to look into and get prices for a granite retaining wall in the water side of the property, Chairman, Peter Marks, with his committee contacted the U.S. Corps of Army Engineers, various regulatory bodies, and getting granite blocks, having them hauled, plans made, documents procured, permits got, contractors hired, fill negotiated for, which took the combined efforts of Commodore James McCaffrey, Peter Marks P.C., and now Secretary A.J. (Gus) Nelson and a diligent committee who obtained a 15 Year SBA Loan. In 1981, it was decided that the Yacht Club needed a Club manager, to operate the bar, to look after maintenance and upkeep of the building, including operate as a function manager. This went on until the spring of 1985, we reverted back to our former operation with a few minor changes. In 1982, The Float Committee, under the guidance of Thomas Corbett, built, bought and remodeled some more floats and added some to the marina, to handle an additional 10 boats. In 1983, Vice Commodore, Bob Keeler, managed to get hold of 3 small sailboats “Turnabout Class” and rebuilt them in an effort to revive an interest in sailing among the junior members. In 1984, a new fence was installed on the Pleasant Street side of the property and a concrete walk was installed along the side of the building facing the parking lot. In the summer 1985, the work crew got together with Planning Committee Chairman, Lee McNeil, and built an outside shower room, including toilets with cement blocks to match the building, which was usable in 1986. Thomas Corbett, Jr. was elected 1987 – 1988. During his regime members removed the old barge in order to have a sea wall built as well as paving the parking lot which was originally a pile of dirt. We poured concrete from the back of the building to the showers as well as the back gate. We also extended the bottom deck to make it wider and more secure. On the 4th of July weekend, PPYC rented a booth to help raise money for the Jerry Lewis Telethon. During this time, two members at a time worked 4 hour shifts. Thereafter, for the next two years, the Friday night before Labor Day, a group of members would go to all the local yacht clubs and organizations to raise money for the Telethon. One Sunday morning, members of the club awoke to a sunken sailboat. A member, Hank Sherman owned this large boat which once the members had risen it out of the water the only item left to salvage was the sail mast, which today still stands as our flagpole, in the front of the club. In 1988, the club was at a point in time that they needed a club launch. So given the direction, the club purchased their very first work boat. Thomas Corbett, Jr., Commodore, made a motion during a monthly membership meeting to allow females to become members of Pleasant Park Yacht Club. The male members, at this time, were not in favor of the motion but ironically the following year under Albert J. Marley, Jr. the motion was passed. Alice Kneeland has the distinction of being voted in as the first female member in 1989. In 1990, Frank Porcaro was elected Commodore and following in 1991, was Patrick A. Marino. During these two years the club remained status quo but large efforts were taken in trying to increase membership and maintenance of the club. In the years, 1992 – 1993, Thomas Corbett, Jr. was elected Commodore for a second term. Throughout the winter months after the election, members gathered in the large hall every weekend to begin building new docks. This took a lot of time and effort by the members but the dedication was overwhelming and joyful, the last dock built was known as the “Party Float.” For the next 17 years ahead, many festive events were held on this float. In addition to the building efforts of the floats, many members gave their time and talent to building the upstairs lounge. The club needed to purchase all new lounge equipment & furniture in order to make this area enjoyable for members to come eat, drink and be social. Thomas Corbett Jr., along with other committee members, helped organize Las Vegas nights in order to raise money to support the building projects taking place that year. Many other local club members had participated in very successful nights. In 1998, Thomas Corbett, Jr., was elected for a 3rd term as Commodore. His dedication to the club had been strong after 10 years of being on the Board of Directors and 8 years as Float Chairman. During this term, he coordinated the First Annual Softball Game between the “Bar Flies & “Bilge Rats”. Anyone could play, men, women, and children. In 1999-2000, James Lawrence Jr. was elected as Commodore. During his term, members gathered to remodel the downstairs lounge which is currently known as “Augustine J. Nelson Memorial Hall”, which is currently rented for smaller functions. The club’s financing was in difficult times and there was a meeting being held to discuss the possibly of closing the club. Fortunately, the following year under Arthur W. Lamb we were able to begin stabilizing the financial debts of PPYC. Record keeping was computerized, credit was resumed with vendor for goods and services and the bottom line went from $30,000 in the red to $60,000 in the black by December 2002. During Arthur W. Lamb’s term, members rallied to make repairs to the floats and maintain the yard and grounds, as well as repairs to the building, picnic tables, and benches. They also maintained yard equipment for hauling and launch days, railway, lockers and outside wall to abutter. Committee and Members improved heating, electrical, plumbing, gas/dock system, roof and gutters. In addition some equipment was purchased for the club’s use such as commercial coffee maker, folding tables, portable air conditioners, gas grill and a new juke box for the upstairs lounge. The back of the club at this time also encountered a facelift. Two new awnings were purchased, installed new gate to the gang plank, repaired member card lock and all keys & locks were changed throughout the club. The design of the new glass wall and doors in the Larson Hall was in process; simultaneously a hall rental agreement was put in place. In 2001, a crisis was avoided by fast thinking Jr. member Billy Schultes, Assistant Dock Master. A boater, after refueling his boat, started the engine without venting and the boat exploded. Billy acted quickly by shutting down the fuel system and grabbing the emergency equipment. The Winthrop Police & Fire, U.S. Coast Guard and MassPort all praised him for his quick thinking. This was a fine example of our Jr. Members and he was presented with a certificate of appreciation. 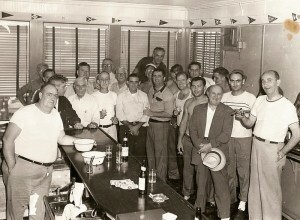 Social events at the club included a Stage Show with buffet, Jr. Member’s camping trips, Fishing Derbies, Lobster & Steak Events and Seasonal & Holiday parties . Arthur’s years, 2000-2002 were top off by a generous donation of an American flag with stand for the Larson Hall. In 2003 – 2004, Albert Marley Jr. finalized the refinancing with Saugus Bank, which placed the club in a better position. Al also oversaw the completion of the new glass wall in the Larson Hall. The new glass façade, designed by Architect Bob Romano, gave a hall a fresh look from the inside out. During Al’s term, he also completed a Fire Life Safety upgrade and held a WINARC Golf Fundraiser on July 12, 2004 at the Winthrop Golf Course. On March 23, 2003, Pleasant Park Yacht Club experienced their second major boat fire in the parking lot. There were 15 boats involved, of which 13 of them were completely destroyed. Member’s dedicated their time and support to clean up the large mess and assisted members in finding new boats before the 2003 season began. In 2006-2007, Ira Zigelbaum, was elected Commodore. In his efforts to unite and utilize the skill of our talented membership the Board of Directors, with the support of the general membership, elected to overhaul the upstairs locker. Not only did the membership donate their time, energy, tools and in some cases the material, but the money to add three 27 inch HD televisions suspended from center of the bar ceiling so they could be viewed from all sides of the bar. One of the next challenges we faced was to become compliant with the States Handicap Rules and Regulations for vehicle parking at our facility. Needless to say when the call went to our membership for assistance to help resolve task at hand; the membership as always, came through with all the necessary signs, ground markings, and ramps for the State inspectors to approve our facility. During an inspection of our facility by the Army Corps of Engineers it became apparent that a large percentage of our marina was not representative of what was on file; coupled with an additional problem at MLW some of our floats were sitting in mud. In evaluating our circumstance and considering one of the areas facing most yacht clubs is the shortage of marina spaces. It was time to fix the situation or lose our permit to operate and explore the idea of increasing our marina at a feasible price. In order for the club to undertake the expansion of the marina it was necessary to sell off the use of the spaces by obtaining an upfront, no cost loan to the club from the members looking to occupy a new space. Coupled with the advent of new docks and the increasing number of newer and larger vessels it was time to update our hauling frame, gasoline hoses, and our electrical system supporting the marina. As always our membership tackled the projects by collectively designing, building and pulling in new hoses and electrical cables and boxes to distribute the power draw. Richard Barry was elected Commodore in 2008 – 2009. During his 2 year term he continued to seek approval for the club expansion with the Army Corps of Engineers, the town Conservation Committee, our Lawyer, the Civil Engineer team, the Marina Construction Company, Electricians, Plumbers and members looking to purchase a float space. Ira Zigelbaum, P.C. continued to work closely with Richard Barry and his float expansion committee until final approval of Chapter 91 was signed of on September 9, 2009. The construction company began immediately following haul day in November 2009 and completed Pleasant Park Yacht Club’s new dock in December 2009. The 100th year, 2010, began with the continuation of the new marina build out and our own members, Darin DuNucci, DuNucci Electric, Tom DiBartolomeo, T.P.P. Co. and Peter Hanson, P.G. Hanson Co. completed the necessary utility hookups. In addition to the contractors, Messias Dias, Float Chairman, Jim Powers, Thomas Stack, Steve Rizzo, Alan Egan, Roy Kartman, & other member who dedicated weekend time to preparing the marina by installing the additional finger floats for May 1, 2010, launch day. Commodore of 2010, Christopher Wolseley, with the efforts of all his committee chairpersons are working hard on multiple projects: new hall lighting and drapes, heating system, sanitization of galleys and restrooms, landscaping and many smaller projects throughout the club inside and out in preparation for our Pleasant Park Yacht Club 100th Centennial Opening Night.